The tragic shooting of Cpl. 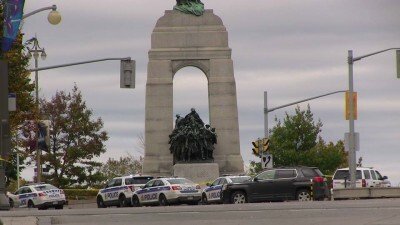 Nathan Cirillo on October 22, 2014 at the War Memorial in Ottawa, Ontario, Canada followed by a shoot-out at the House of Commons, and the death of the shooter, Michael Zebaf-Bibeau, serves as a catalyst to advance several hidden government agendas. The Canadian government wants to spread unreasonable fear of radical, violent Muslim terrorists so that it can better control all Canadians, especially those who choose to exercise their constitutionally enshrined rights. The government is also advancing a social control mechanism so that it can deny and negate domestic constitutional rights, in particular Section 35 of the Constitution Act, 1982 which recognizes and affirms aboriginal and treaty rights. If prominent indigenous activists such as Clayton Thomas Muller – who is currently being surveilled by police agencies —- are fraudulently labelled as “terrorists”, then he and other freedom-loving Canadians can be further controlled and oppressed by police state legislation. Finally, the government also wants to advance its support for the ongoing US-NATO war in Iraq and elsewhere, ostensibly to combat ISIS/ISIL/IS. The theory that U.S agencies were somehow implicated in the tragedy is further reinforced by the fact that Operation Determined Dragon, a joint Canada/U.S counter-terrorism drill, was executed from 20 to 29 October 2014, so the murder of Cpl. Nathan Cirillo coincided with the time that Determined Dragon was being executed. Yet the Canadian government frames this tragedy as rooted in Islamic terrorism rather than the more credible alternative: that a homeless drug addict could have been used as a tool to further an already finalized agenda to participate in an illegal war in Iraq, and to restrict the rights and freedoms of all Canadians. Not surprisingly, the passing of the anti-constitutional surveillance law – Bill C-13, had also been expedited. While we may never get all the answers, it is unfortunate that this tragedy is being exploited to advance illegal war, and police state agendas. Instead of spending our tax dollars on War Inc. and domestic surveillance, Canada –- and the world – would be better served if those funds were redirected to improvements in mental health care services, and housing for the homeless.